Enhance your custom folders with your company name, logo, or title with our customized printing services on custom folders, custom plastic comb binders, and custom ring binders. Advanced Document Systems & Supply Inc. is proud to offer high quality custom printing services for a superior and customized product packaging, printed to your unique specifications. Custom folders will hold paper and documents together while also projecting a distinguished and elegant branding message for your presentation. We offer many customized printing options: silk screening, embossing or de-bossing, foil stamping, or offset printing using your company colors and logo on the front and/or spine of your binders. Please note that for plastic comb binders, logos and large copy will look better on larger combs, although we do offer printing on any size. Custom vinyl and poly products are also available. 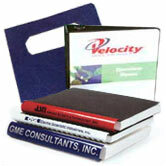 In addition, we carry clear overlay binders to accept your custom printed insert. Our printing services can also accommodate the design and creation of a new look for your custom presentation folders and binders. Simply call us with your Pantone colors, or send us a sample to match. Custom order products are subject to a minimum order. Contact us today for a quote on your custom order. Advanced Document Systems Inc also offers readily available presentation materials including Document Covers, Clear Covers, Composition Covers, Ring Binders and more! Browse our selection of supplies, including wire binding supplies, coil binding supplies, thermal bind covers, plus a large assortment of binding machines and laminating machines. Contact our knowledgeable staff today for the widest selection, lowest prices and unsurpassed service on all types of binding machines, laminating machines, binding supplies, and paper products: 800.808.2377.